Ok guys, I'm finally back, to make my (somewhat sheepish) return to the world of blogging. Which is also a return to the world of internet, sadly. Our internet provider, who shall remain nameless... but begins with a V and ends in an N... has royally screwed this loyal customer of 6 years and seems not to care. We moved into our new house in early May, and despite numerous promises, breakings of self-imposed deadlines, and half-hearted apologies, we are still awaiting our phone and internet to be in complete working order. Trust me, that is the very short and very diplomatic version of my sad tale. However, since this is the most the internet has worked in over 3 weeks, I will take advantage! It's all probably for the best that I took a little break, anyway, as Mr. Vittles and I have been busy little beavers. The first weekend of May was spent moving, then the next unpacking & also celebrating mother's day. The next was spent in upstate New York and Canada congratulating my brother-in-law Nick on his graduation from St. Lawrence University. And the last was spent in the Virginia/DC area celebrating our friends T.J. and Adrienne's wedding. Thankfully our two long weekends out of town were spent doing fun things. But that much time away from the homefront didn't help our unpacking/settling momentum.... and certainly not my cooking/baking motivation, which in turn impacts the blogging. But... here we are. And hopefully I'm back in action. I have to ask one thing, though- how could it possibly be the first weekend of June already? Despite what the calendar tells me, here at the Jersey Shore we know that the period between Memorial Day and Labor Day is the actual season of 'summer.' 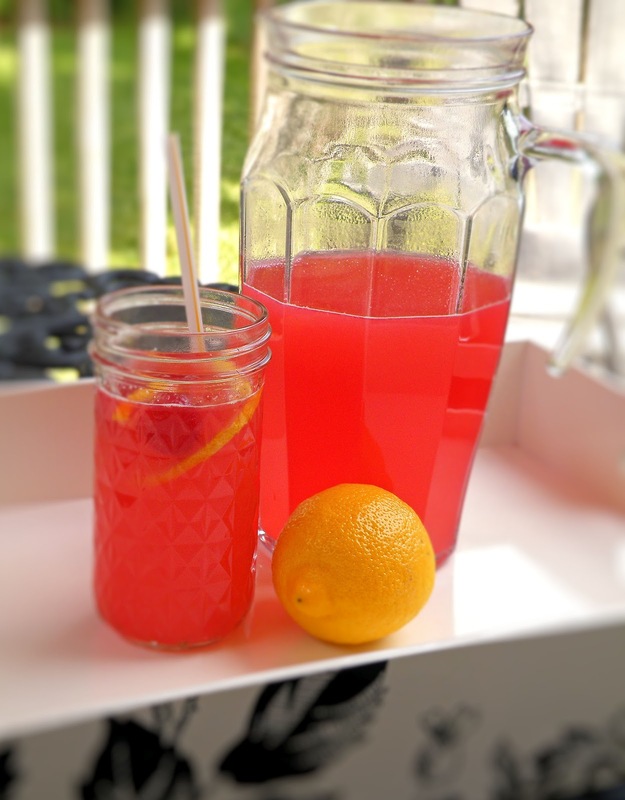 So I thought it was time to make a nice summer refreshment - raspberry lemonade! Mr V. took a sip of the finished product after warily eyeing the leftover raspberry & lemon pulp in the sink, and looked genuinely surprised. "Wow," he said. "That's really good." He took a second sip. "Now I know what lemonade tastes like with real raspberries in it." And it's true - this is soooo much better than the artificial raspberry taste you get with most lemonades on the market. Nothing beats the fresh stuff! 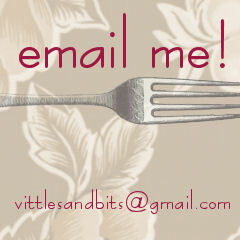 Anyway - hope y'all are doing well, and I'm looking forward to getting into some more seasonal recipes with you soon! Slice one of the lemons thinly, discarding the ends. Set slices aside. Combine lemon juice with cold water in a pitcher or large bowl with a spout, and set aside. In a smaller bowl, combine half of the lemon slices with the raspberries and sugar. Using a potato masher (or a heavy, flat-bottomed item such as a wine bottle) muddle the fruits with the sugar until juices are released and sugar starts to dissolve. Add muddled mixture to lemon/water mixture, and stir until sugar is completely dissolved. Pour entire mixture through a sieve into a separate bowl or pitcher - discard the seeds, pulp, and lemon rinds. (Keep in mind that the finer-mesh sieve you use for straining, the less chance there is of small seed and pup bits getting into your lemonade). Serve lemonade chilled or over ice*, and garnish with remaining lemon slices. Serves 3-4 people. *Tip: If you have additional raspberries, you can freeze them to use as ice so the lemonade doesn't get watered down. Or you can use the already-frozen kind. What a tasty post to return to! Sounds tasty and refreshing and well, I'm a berry girl so it is right up my alley! Welcome back, Maggie! And what a comeback! My favorite Summer drink :) Sorry to hear about your internet provider.. They never seem to care about us.. Missed ya too! Thanks! You are very sweet :) As for internet- ugh, so true!! Refreshing and gorgeous, quite a comeback! Im glad your back though and this lemonade looks tasty - specially for summertime!